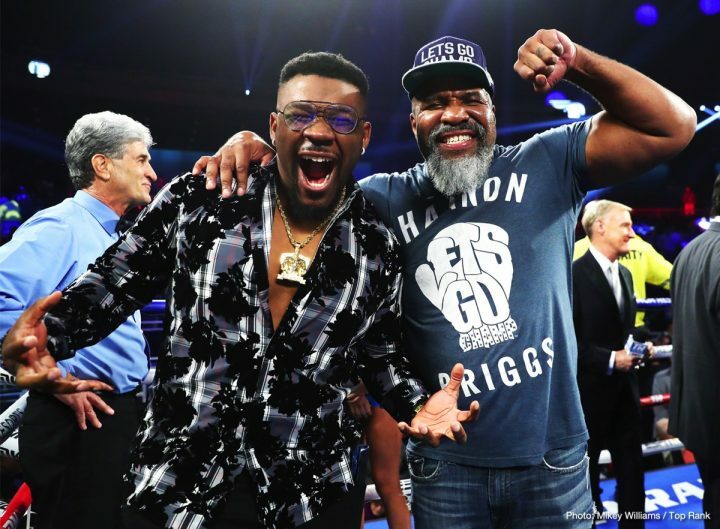 By Tim Royner: Jarrell ‘Big Baby’ Miller says he’s not received an offer from Matchroom Boxing for him to face Anthony Joshua on April 13, and he believes that Dillian Whyte is the opponent that will ultimately be facing AJ at Wembley Stadium in London, UK. Miller (23-0-1, 20 KOs) says that the offers that has been made by Joshua for Whyte isn’t enough for him to get him to sign, as he believes it’s just a little bit more than what Dillian received for his recent rematch with Dereck Chisora on December 22. Whyte, Tyson Fury and Deontay Wilder have all rejected the offers made to them by Matchroom for a fight against IBF/WBA/WBO heavyweight champion Joshua (22-0, 21 KOs). Joshua’s promoter Eddie Hearn is down to the wire where he’s going to need to find someone quick for AJ’s April 13 fight. That means that Hearn will need to sweeten the offer enough to get Whyte to accept a deal to fight with Joshua or they’re going to need to sign the 30-year-old Miller, who is waiting eagerly to take the fight. If Hearn decides to have Joshua move off his April 13 date to instead fight in June in the United States against Miller, then that buys him more time to get AJ’s next fight signed. Hearn would have until at least February to get the fight signed with Miller, and then announce it to the boxing world. It’s good news that Miller is there for Matchroom to use in case they’re unable to work a deal with Whyte. Wilder and Fury are both out of the running for a fight against Joshua, given that Hearn doesn’t want to increase the 60/40 offer that he’s made to them. Both want a 50/50 deal. Hearn insist that’s not going to happen. Hearn previously said that Joshua’s opponent needed to be signed by December 1. Here it is now January 25, and Hearn still doesn’t have an opponent signed, and it doesn’t look like he’s going to have anyone for Joshua anytime soon. Oleksander Usyk would be an option, but he’s still not decided whether he’ll be moving up to heavyweight or not. Hearn can probably sign Usyk if he’s willing to make the move up. However, Usyk is a bad match-up for slow-footed Joshua, who struggled with the movement that 41-year-old Wadimir Klitschko used in their fight in 2017. Usyk would be all over the ring, hitting Joshua from odd angles, and potentially tiring him out to the point where he’d drop. It’s agreed by many boxing fans that Whyte, 30, is the best option for Joshua to fight next on April 13. Whyte has these things going for him: 1. popularity in the UK 2. he’s earned the fight by beating Dereck Chisora, Joseph Parker and Lucas Browne 3. he can help sellout Wembley stadium.